How Long Does Fentanyl Stay in Your System, Blood, Urine? Fentanyl is an opioid most commonly prescribed to people who suffer from severe pain episodes. This drug is a Schedule II medication, which means that it has a high potential for abuse. Similarly to Morphine and Heroin, Fentanyl activates the receptors in the brain that are responsible for the sensation of euphoria. This dangerous substance is almost 50 times more potent than Heroin. What are the Factors That Influence the Duration of Fentanyl’s Presence in Your System? It is proven that older users tend to metabolize Fentanyl much slower than younger ones. According to Bentley and associates, drug elimination in the group of patients younger than 50 was 265 minutes, and in the panel of patients older than 60, it took 945 minutes. Cheymol suggests that people with a higher percentage of body fat metabolize Fentanyl longer than users with low body fat index because they have less adipose tissue where Fentanyl can accumulate. Most of the Fentanyl is metabolized in the liver by the CYP3A4 enzyme. People suffering from cirrhosis or other hepatic conditions tend to eliminate Fentanyl at a slower rate than healthy individuals. Some people are genetically predisposed to metabolize Fentanyl much slower than others. Several alleles of CYP3A4 are responsible for poor Fentanyl metabolism. Keeping in mind that most of the Fentanyl is eliminated through urine, it is clear that proper hydration can shorten the time needed for thorough elimination of the drug. It is commonly known that people with higher basal metabolic rate (BMR) burn more energy during rest. Therefore, higher BMR can have a positive impact on Fentanyl excretion time. There are three routes of Fentanyl administration—intravenous, transmucosal, and transdermal. For intravenous users, it takes 11 to 22 hours to eliminate Fentanyl from blood plasma.When it comes to transmucosal users, it takes up to 3.4 days to remove the drug, and for transdermal users, elimination time can last more than five days. The greater the dose of the Fentanyl, the more time it will take to excrete it from your system. Combining Fentanyl with other drugs, especially with CYP3A4 inhibitors, may have an adverse impact on fentanyl excretion. How Long Does Fentanyl Stay in Your Blood/ Urine/ Saliva/ Hair? Blood test for Fentanyl is conducted if a person can’t give a urine sample. A blood test can detect the presence of Fentanyl only minutes after the last dose. Also, the drug can be detected days after discontinuation. A urine test is a non-invasive, safe way to determine whether someone is using Fentanyl. The drug can be detected quickly after the ingestion. Fentanyl is detectable through a urine drug test 3 days after the last dose. The saliva test is rarely used in Fentanyl detection due to low accuracy. Hair analysis provides a long detection window for Fentanyl, and it can detect the drug months after the last dose. 25% of fentanyl is absorbed in a user’s mouth via buccal mucosa. The rest of the treatment (75%) is absorbed in the gastrointestinal tract. After the absorption, the drug is distributed in the heart, brain, kidneys, lungs, and spleen. Also, some of it can be deposited in the fat tissue. Fentanyl is metabolized in the liver by the CYP3A4 enzyme, and 90% of it is excreted in urine in the form of metabolites. Fentanyl taken intravenously reaches its peak 30 to 60 minutes post-injection, and analgesic effects kick in 7 to 15 minutes after ingestion. Effects of the drug start to fade away 1 to 2 hours after administration. 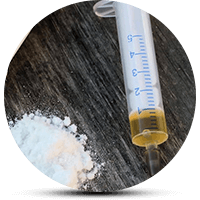 Addiction Resource » Addictive Substances: The Anatomy of Drug Addiction » Fentanyl Abuse and Addiction: A Complete Guide » How Long Does Fentanyl Stay in Your System? If a 50mcg transdermal fentynal patch is on a patient Monday 0600am removed Thursday 0600am, would the fentynal show up on a simple in-office urinalysis one week later? If a urinalysis were to be executed 7 days from the Thursday 0600am removal would the fentynal be detected? If fentanyl was found in a particular batch of heroin & patient used it intravenously on Friday 2:30pm will it show a positive result 5days later; given that the urine sample goes out to a lab to be dissected & specifically looks for it & its metabolites? This particular patient does have a higher BMI than normal range and has chronic HVC that thus far has not been treated for as of yet. Will fentanyl still come up as positive in urine 48 hrs after inhalation and drinking 5-7glasses of water for per day for said 48 hrs? After last use of fentanyl by snorting will it be detected in urine 48 hrs later after drinking gallon of water and using multivitamin and vitamin c each day of 48 hr interval? What are therapeutic range for a 100mcg patch? It’s probably because of your body weigh, age etc. I don’t weigh too much. Only 148lbs. And it took around 9-10 days for it to leave my system. It’s weird to me and a bit annoying. Angel, it’s the 12th of April. How long did it eventually take to leave your system?